Billfolda offers an equity fundraising services under an Australian Financial Services License that is authorised to provide a crowdfunding service via its online offer platform. 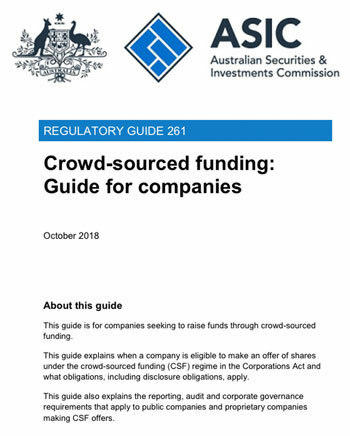 This is commonly referred to as Crowd Sourced Funding (CSF) under which eligible companies can raise funds of up to AUD 5 million dollars under a CSF offer in any one 12 month period. Billfolda also offers a private fund raising service of up to AUD 2 million operating under the exempt offers that do not need disclosure provisions of the Corporations Act 2001 (Cth) (Corporations Act). CSF is better known as equity crowdfunding and is the online offer of fully paid ordinary shares in eligible companies to both retail and wholesale investors. Equity crowdfunding involves investment in the shares of eligible commercial enterprises and is subject to strict new legislation that has recently been enacted. However, there substantial concession that apply to CSF offers when compared to existing Initial public offer (IPO) legislation, though readers must note that ‘rewards / pre-purchase’ crowdfunding and CSF maintain few parallels for the offer company. We know a lot about the new crowd sourced funding laws and regulations, as we helped to create these over the past four years, however most companies will have a lot to learn, and be in need of substantive professional guidance. Thankfully ASIC have provided much of the information you need as a Director exploring the possibility of obtaining funding through this newly formulated funding regime. Guide for public companies outlines your obligations, including disclosure obligations, a template for your offer, obligations to investors, problems that may arise and the temporary corporate governance and reporting concessions that can apply. We require every CSF issuer to be aware of these regulations, though you can expect our software and processes to assist you in many ways through to completion of your funding round.